With crime constantly on the rise, it is of little surprise that both homeowners and business owners are constantly looking for ways to improve their safety and security. Break-ins and other unwanted intrusions can occur any time of the day or night; therefore it is very important to ensure that one’s home or workplace is being protected from all possible intrusions. While many security systems are quite expensive, the best security camera system to use through windows at home or office is one security system that is not only subtle, but can easily fit into any budget. There is a controversy or a debate rather, if a security camera should be hid behind a window or not. For one, you will definitely lose some clarity of view as opposed to the camera not having glass right in front of it. On the other hand, the potential of having the camera itself being destroyed or tampered with by an intruder goes down unless the intruder breaks the glass which in that case you better hope to have an alarm system installed in the home with window sensors because your camera will be no use to you at that point. Depending on the model an individual chooses to purchase, some cameras can be hidden by being clipped to a curtain or window blind; while others can be placed directly on a windowsill or clipped to a curtain rod. Most cameras can be hooked directly into an individual’s computer and will continually record what they capture; while others can feed to a television set in another room. A wired camera uses sensors that can be placed near windows and the wires required to set them up can easily be hidden behind doors and curtains, or under carpets in order to mask their appearance. Key pads, motion detectors and other accessories can also be used with a wired camera to increase the security of one’s home or business. While wired cameras can be tampered with or completely taken down, the camera will be able to detect and record the process; which can also be used for incrimination against a suspect. 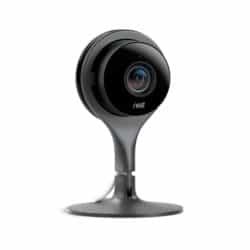 Wireless cameras use the same sensors as wired ones do and can also be partnered with other features such as spotlights and motion sensors. Something that an individual or business owner needs to take into consideration when purchasing a security camera that they plan to use through windows is that each camera has its own features and most of those features in today’s cameras revolve around producing crisp, clean images during the day and even at night. In most cases most cameras do not fare well behind a window mainly for the simple fact that you are taking away from the potential of what that camera can do if it was placed somewhere in play daylight. This takes us to the point about night footage behind a window. Point blank it is almost impossible to get a good clear image of the outside elements at night if a camera is hiding behind a window. Not only do you have the problem with glare if a light is used in that specific room where the camera is placed, but also that room could probably not be used with no lights on at all if you want to catch specific action right outside the window of that room. Night-vision and day-use cameras are not interchangeable, though they can be used simultaneously in order to keep a home or office completely secure but most modern security camera systems provide options for both all in one unit. Of course, some camera systems do better at night than others. For example the EZVIZ Husky HD 1080p Outdoor Security Camera System offers one of the best video quality that we have seen in security cameras but not just during daytime but also during night time at 1080p. As impressive as this camera system is yet some of that night clarity will be lost behind a window. Some people still insist on using a security camera through a window and if your one of those individuals then here is a solution. Potentially the lighting coming through the window is enough to get an image as well as trigger motion detection with the camera. However a problem that people run into when using an IR (Infrared) security camera is the light from the camera’s lamp being reflected by the window right into the camera lens. By Popular Demand The Best Camera To Use Behind A Window Is…..
1. Automate the porch lights to turn on at dark and to turn off in the morning. 2. Position the Nest Cam appropriately and turn off motion alerts and as well as night vision. 3. Signup for a service such as Camio which adds a level of intelligence to your camera setup. 4. Draw activity zones around the areas you want to monitor. For example, you may want to monitor part of your driveway and porch. Note: that you may have to play with your drawn out zones because the picture may be 3D to you, but it is not to the software. 5. When you have signed up for Camio you can tell it what you want it to monitor and what to ignore by giving the provided notifications it will produce a thumbs up or a thumbs down. 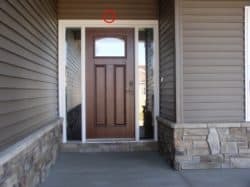 When installing a security camera, people should make sure that the sensors are placed in areas that could attract the most attention, such as near doorways and windows; this will allow the cameras to protect those vulnerable areas from intrusion. Something else that homeowners need to be made aware of is the fact that theft is oftentimes committed by people that the homeowner already knows. Therefore, it is a good idea to turn on surveillance cameras when company is over, or when a babysitter’s services are required. In the case of babysitters, cameras can also be used to watch for neglect or abuse, if they suspect either are happening. Office burglaries are quite commonplace these days, especially if a company is known to keep money or sensitive documents on premises. Therefore, it is imperative for a business-owner to always know who is entering and leaving their business at all times. 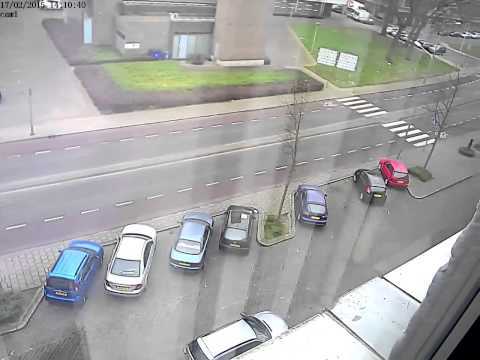 Cameras can not only record who has entered and left the building, but what vehicle they arrived and left in as well; which can be used as evidence, if it becomes necessary to do so. An individual’s home or business should be spared no expense when someone knows that they live in a high-crime area. Surveillance cameras, even if they do not detect critical footage at all times, can be used to deter crime. No criminal wants to be caught in the act of breaking and entering; therefore, they will be far less likely to burglarize a building or house that has a camera installed. A good security camera system is just one of many security methods that can protect one’s family and livelihood from danger.